As I write this on the morning of Labour Day, it is already 38 degrees Celsius with the humidex in Southern Ontario, another day of oppressive heat and humidity in a long line of them this summer. Scientific consensus points to the ever-increasing effects of climate change as the chief agent responsible for a summer that has seen extreme temperatures worldwide. The key, if there still is one, to mitigating this unfolding disaster, is to wean ourselves as quickly as possible, off of fossil fuels. 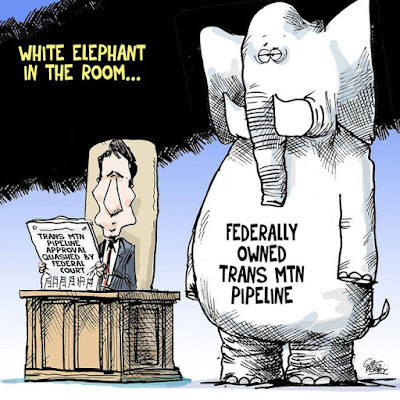 Last week, the Federal Court of Appeal told the government what they should have already known about the proposed Trans Mountain pipeline expansion — the National Energy Board vetting process was horribly flawed, and there was inadequate consultation with the Indigenous people who are affected by it. The proposed pipeline expansion is simply unfathomable. Even without citizen protests, the financial community knows that investment in the oilsands has no future. Bankers are pulling out and current investors are looking simply to recover their existing investments. Canada has wasted billions in subsidies to oil companies instead of building the infrastructure for a renewable energy industry. Even when the oil industry was viable, Alberta failed to recover the revenues it was entitled to with too low taxes and too low royalties. Meanwhile, Norway has made its citizens millionaires by nationalizing its oil industry and undertaking development in an environmentally sustainable way. Canada has given its resources away for a song and now has little to show for it. Compounding the mistake by continuing to prop up a failing industry is a crime against future generations. Canada and its citizens will have to make wrenching adaptations just to survive when the true cost of climate change hits us. I fear for my children and grandchildren. Our resources should be directed to building renewable energy and transitioning the workers who will be affected. Those currently employed by the fossil fuel industry should not bear the brunt of the transition. They should be supported by all other Canadians through our tax dollars as they are retrained and find new jobs. I implore the government to end the Trans Mountain pipeline and tanker project now, for the sake of our future generations. Woodenheadness, Lorne, leads to disaster. I am currently reading a book entitled Climate of Hope, by Michael Bloomberg and Carl Pope, Owen. it is stirring to read what can be accomplished on a national, sub-national and local level to mitigate climate change when there is vision. Unfortunately, Trudeau's rhetoric notwithstanding, Canada still seems very much locked in to doing things "the old way."